Cast down and across at 45 degrees, upstream mend as we where taught by our forefathers, fly swings across and we repeat the same process over and over again. If we are lucky we may even catch a fish or two. For many this is how we fish the fly when attempting to catch that great prize, the Atlantic Salmon, and yes it certainly worked when our fathers were fishing for Salmon and most rivers had great runs of fish. It still works today too but there is much more that we can do to increase our chances. So what’s wrong with the old ways, well down and across at 45 degrees with an upstream mend serves to slow the fly down as it traverses the current, in other words it fishes the fly slowly. 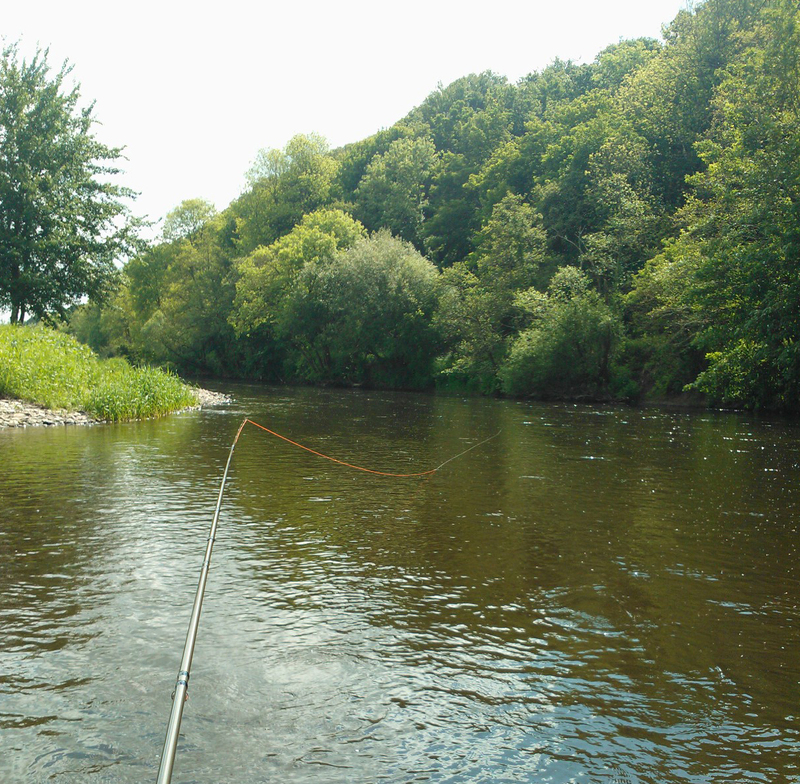 This technique was also employed on the basis that the upstream mend allowed the fly to sink a little prior to the swing. I will still use this technique in very cold water perhaps at the start of the season and it will serve you very well to fish the fly deep and slow. This then begs the question why shouldn’t we fish the fly this way? Why not fish the fly slowly, it’s caught fish in the past and still does. In and of itself there is nothing wrong with this tactic but it shouldn’t be the only tactic employed to the exclusion of all else. I have seen many anglers with upstream mend muscle memory, it becomes automatic and a habit that at times can decrease your chances of catching a Salmon. When it comes to deciding how to fish and present the fly we need to bear in mind that the Salmon is a powerful predator and a very capable one at that, it hunts with aggression and speed. Despite the fact that it does not feed in fresh water we still need to trigger those instincts and responses by presenting a fly in such a way as to resemble or mimic what it may have been feeding upon in saltwater. It not just a question of fishing a fly that resembles these food sources and let’s face it apart from a few patterns our flies will look a little bit like a lot of food items but nothing in particular, more often than not only giving an impression rather than an exact imitation. This is what makes the flies behaviour or movement all the more important. Food items will not swim along at a slow pace in the presence of a predator they will attempt to flee. Then why should our flies not be presented in the same manner? We need to provoke an instinctive feeding or aggressive response from the Salmon to get them to chase and take the fly. Like many predators on this world unless they are hungry remaining calm in their presence will not provoke an aggressive reaction or trigger a hunting response but try running away in this situation and those instincts will be triggered immediately. We have established that more can be done to entice the Salmon to take our fly but how do we accomplish this. We need to change how we think about our fishing and tactics particularly with regards to the fly line. Many anglers will think of the fly line as a way of transporting (casting) the fly, but it’s also a way of controlling the fly once in the water, our connection to the fly. A connection that allows us to influence it’s behaviour and in turn the way in which we present the fly to the Salmon. For many years we had a floating a sinking line probably an old wet cel 2 but we have so much more choice now when it comes to choosing a line. The older style of fishing a fly down and across really stems from the lines that were available way back then. You fished the wet cel in cold water early on in the year and the floater once the water passed 10 degrees celcius though the technique still tended to be the same – down and across with an upstream mend. As mentioned one of the reasons for the upstream mend was to allow the fly to sink a little prior to traversing the current due to the slack imparted by the mend. Today however with modern lines the depth we fish the fly at should be a function of the line and the angle at which we cast. Mending the line is no longer required in order to get the fly to the required depth. In this situation slack line is never a good thing, the fly should be fishing correctly from the moment it touches the water until we start the next cast. Lines such as the Triple-D F/H/I, F/I//S2 & F/S2/S4 allow us to maintain total control of the fly’s presentation through out the cast. DDC, Skagit or any line that has a floating belly/section will always offer the most control and precision. Well outside of the very cold spring conditions when slow and deep tends to work best we could be fishing our flies a little faster and presenting the fly more broadside so it appears to be travelling more across the current rather than against it. This shows the full silhouette to the fish it also ensures that the fish takes the fly from the side. Takes like this genreally produce very good hook ups with the hooks firmly imbedded in the scissors instead of those annoying tweaks and pulls often resulting from a slow fished fly as the fish just nips at the tail fibres. Maintain the fly’s speed as it comes round by means of drawing the rod tip into the home bank or a steady retrieval of the line. This is critical otherwise the fly will lose its action and any following fish will loose interest. If anything we should smoothly accelerate the fly at this point to trigger an instinctive take, just be ready. Stripping a fly back quickly such as a Sunray or Monkey is another very succesful method again playing to the Salmon’s instinct to chase. However its not just about employing one or more of the well defined tcchniques but about reading each piece of water and determining what might work best for a given situation. Its rare to find two pools that will both fish to the same tactic, often no two casts are the same. There is one tactic that I think is my favourite, especially when fishing a known lie where a Salmon may be resting; Cast at an angle that will bring the fly (not too quickly) just to the edge of the Salmon’s window of vision. (I am sure they know the fly is there long before they see it) The idea is to hold the fly off the lie just long enough till the fish is aware of its presence then to accelerate the fly past the fish by means a downstream mend or a manipulation of the rod tip either will do so long as there is no slack created .This can be considered a form of induced take and a tactic that can produce some very aggressive takes. Regardless of which tactic you decide to employ it’s about making a decision to actively fish the fly in a manner that suits the conditions as many of the worlds most successful Salmon Flyfishers do. There are many more tactics than I could write about in this article so don’t be afraid to experiment. If your chosen tactic is not working when clearly fish are present then change tactics try something different. Its exciting to try something new and a very satisfying experience to catch a fish that you may not have otherwise caught. Casting more squarely on large open pools can be an effective tactic. A good way to cover a large amount of water efficiently when fish could be anywhere within the pool. In this situation a square cast will not need to be cast as far as a 45 degree cast to cover the same amount of water. The shorter cast will always give more presicion when presenting the fly than the long cast. Remember the best fly in the world will not catch if not presented correctly and while fly choice is very important if we all spent as much time deciding how to fish the fly as we do choosing the fly we’d be catching more fish. Pingback: Article by our own Kspey. Thanks to Rune Andre Stokkebekk for reminding us that we don’t have to be boring casting machines. My own view is that we do do those different things to get a salmon to take and often in the intensity of the moment this is forgotten or set aside for a winter fireside thought. But let’s pull it out now. Read this and my favourite bit is casting to a known salmon in a lie just to the edge of the window of vision then bringing on a sort of induced take by speeding up the fly. Cant wait to try this out ..